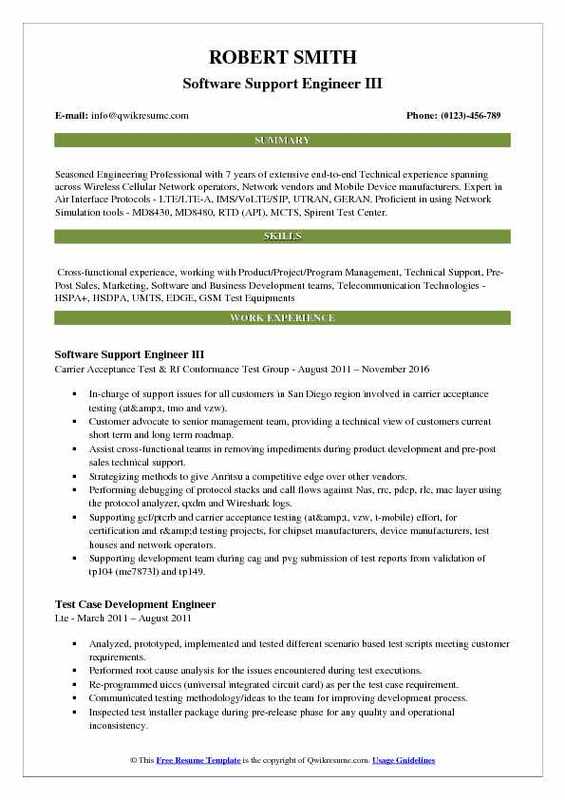 A Software Support Engineer generally troubleshoots as well as develops technical solutions that are related to software. Errors for other professionals like field engineers and technicians as well as customers are also managed by a Software Support Engineer. 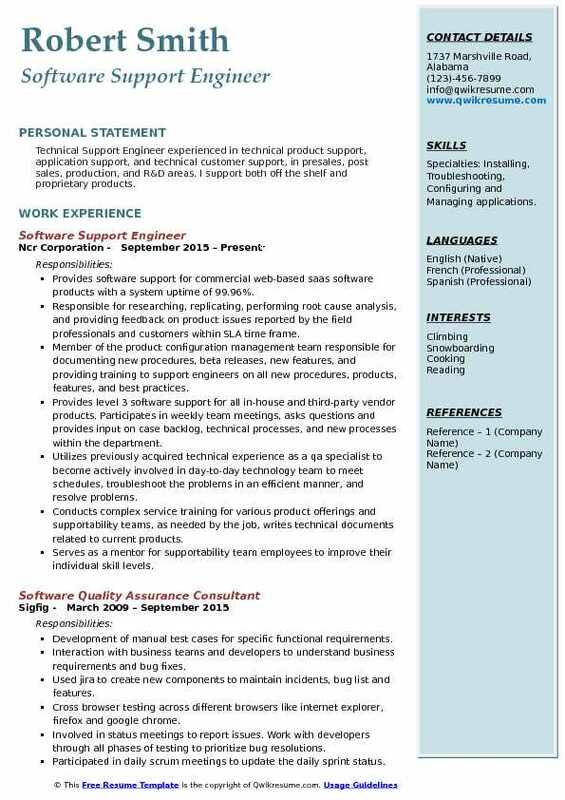 The job responsibilities that are present on the Software Support Engineer Resume are – creating workaround procedures when standard software procedures fail, ensuring issues get resolved in an orderly manner, escalating key problems to internal resources when there is a need for more in-depth knowledge. 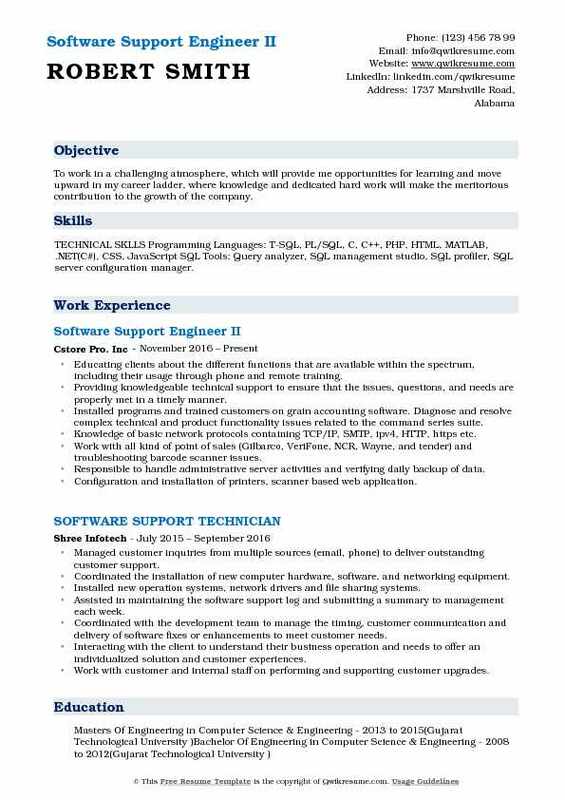 Skills that are required for a successful Software Support Engineer are strong analytical and troubleshooting skills, knowledge in software installation and operation, a knack for communication, especially when it comes to teaching customers on how to install and use new software products. A Bachelor’s Degree in Computer Science and Engineering is one of the key educational qualifications required for a Software Support Engineer. 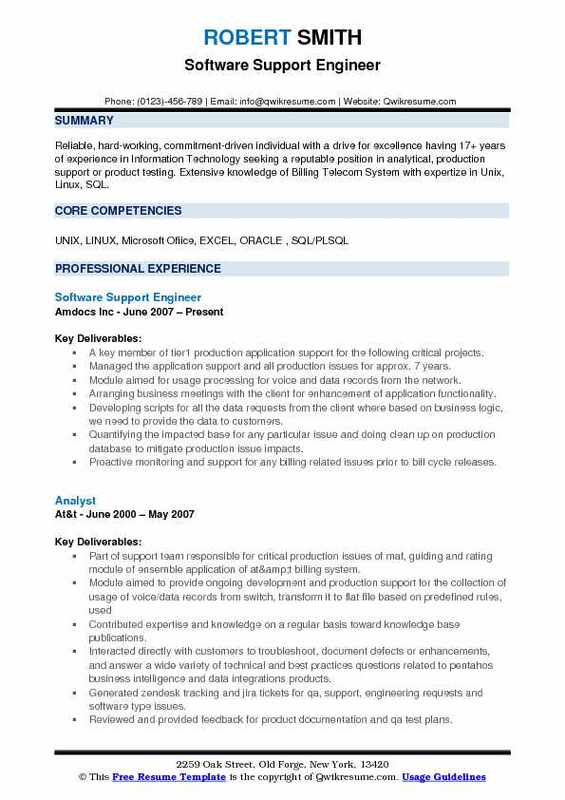 Summary : Software Support Engineer with 10 years of professional experience in mid-range IT production and system test environments. Result-driven, motivated and passionate about leading all stages of system deployment efforts combined with the desire and drive for efficiency, applying proactive, reactive and preventative approaches to achieve quality results. Competencies include a background of strategically focused experience in the design, implementation, and management of highly successful projects. Managed 24/7 technical operations to over 400 production and test systems, utilizing multiple technologies, including patching. Supported, IPTV, DirectTV and mobility applications, providing technical expertise focused on application support, best practice troubleshooting, monitoring, capacity planning and managed multiple high-profile, complex projects by completing updates and changes. Implementing new code and updating existing code in the production environment with little to no errors and downtime. Provided technical infrastructure knowledge and direction to the vendors, developers, system and database administrators and project managers on configuration and architecture of WebSphere application server JBoss software for multiple application support transitions. Managed mission-critical application production systems and support projects across multiple clients. Responsible for on-going technical development of new and veteran team members, providing support and guidance. Assumed responsibility for creating new and maintaining existing code on IBM mainframe for cybernation esp application which ensured timely processing of batch functions. Summary : Reliable, hard-working, commitment-driven individual with a drive for excellence having 17+ years of experience in Information Technology seeking a reputable position in analytical, production support or product testing. Extensive knowledge of Billing Telecom System with expertize in Unix, Linux, SQL. A key member of tier1 production application support for the following critical projects. Managed the application support and all production issues for approx. 7 years. Module aimed for usage processing for voice and data records from the network. Arranging business meetings with the client for enhancement of application functionality. Developing scripts for all the data requests from the client where based on business logic, we need to provide the data to customers. Quantifying the impacted base for any particular issue and doing clean up on production database to mitigate production issue impacts. Proactive monitoring and support for any billing related issues prior to bill cycle releases. Monitoring batch jobs and mitigating issues which affect the data flow between CSM and interfacing applications. Creating alerts in pl/sql on production servers and scheduling them for proactive monitoring. Business meetings with the client for enhancements proposed to the application. Headline : Seasoned Engineering Professional with 7 years of extensive end-to-end Technical experience spanning across Wireless Cellular Network operators, Network vendors and Mobile Device manufacturers. Expert in Air Interface Protocols - LTE/LTE-A, IMS/VoLTE/SIP, UTRAN, GERAN. Proficient in using Network Simulation tools - MD8430, MD8480, RTD (API), MCTS, Spirent Test Center. 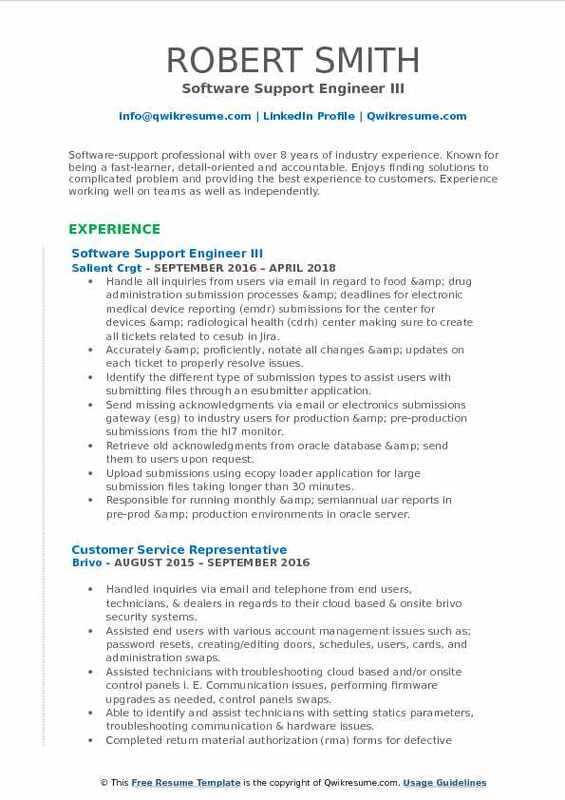 In-charge of support issues for all customers in San Diego region involved in carrier acceptance testing (at&t, tmo and vzw). Customer advocate to senior management team, providing a technical view of customers current short term and long term roadmap. Assist cross-functional teams in removing impediments during product development and pre-post sales technical support. Strategizing methods to give Anritsu a competitive edge over other vendors. Performing debugging of protocol stacks and call flows against Nas, rrc, pdcp, rlc, mac layer using the protocol analyzer, qxdm and Wireshark logs. Supporting gcf/ptcrb and carrier acceptance testing (at&t, vzw, t-mobile) effort, for certification and r&d testing projects, for chipset manufacturers, device manufacturers, test houses and network operators. Supporting development team during cag and pvg submission of test reports from validation of tp104 (me7873l) and tp149. Providing analysis and refutation of downgrade and exception cr that affects Anritsu rfct platforms. Providing technical support to customers for wireless technologies, analyzing and debugging all kind of technical issues, coordinating with cross-functional teams to drive the issues towards resolution and/or actions towards completion, in order to meet or exceed. Identifying potential issues or tool enhancements for the customer and communicating it our product management/development team. Performing sanity, validation (new feature) and regression testing to improve product reliability and to obtain test coverage. Summary : Software-support professional with over 8 years of industry experience. Known for being a fast-learner, detail-oriented and accountable. Enjoys finding solutions to complicated problem and providing the best experience to customers. Experience working well on teams as well as independently. Handle all inquiries from users via email in regard to food & drug administration submission processes & deadlines for electronic medical device reporting (emdr) submissions for the center for devices & radiological health (cdrh) center making sure to create all tickets related to cesub in Jira. Accurately & proficiently, notate all changes & updates on each ticket to properly resolve issues. Identify the different type of submission types to assist users with submitting files through an esubmitter application. Send missing acknowledgments via email or electronics submissions gateway (esg) to industry users for production & pre-production submissions from the hl7 monitor. Retrieve old acknowledgments from oracle database & send them to users upon request. Upload submissions using ecopy loader application for large submission files taking longer than 30 minutes. Responsible for running monthly & semiannual uar reports in pre-prod & production environments in oracle server. Responsible for running monthly deployment & release metrics reports. Remove employees no longer with FDA out of system per request within all cesub account management system (cams) environments. Retrigger scanned submissions that are not in image 2000 application for industry user via Captiva application. Grant all appropriate access to new contract and/or FDA employees for multiple applications. Monitor all server modules within Captiva application & notify engineers of any issues. Summary : Technical Support Engineer experienced in technical product support, application support, and technical customer support, in presales, post sales, production, and R&D areas. I support both off the shelf and proprietary products. 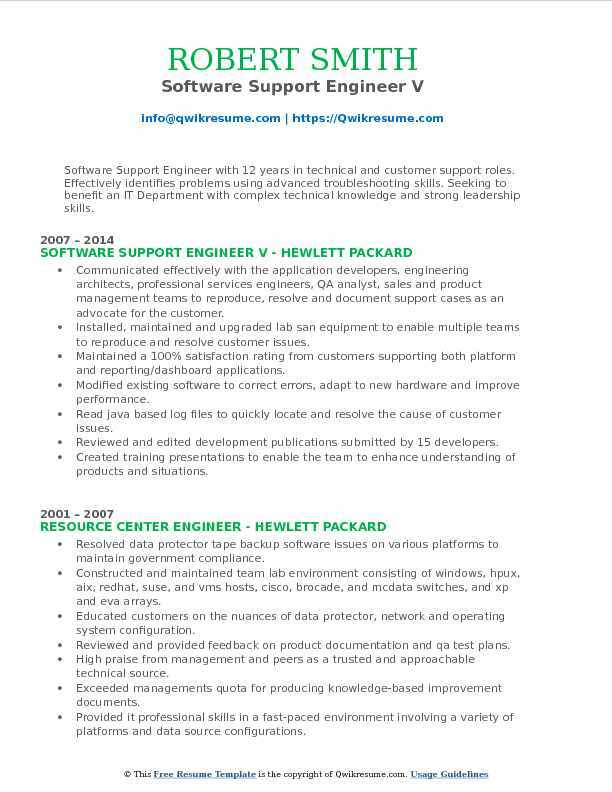 Skills : Specialties: Installing, Troubleshooting, Configuring and Managing applications. Provides software support for commercial web-based saas software products with a system uptime of 99.96%. Responsible for researching, replicating, performing root cause analysis, and providing feedback on product issues reported by the field professionals and customers within SLA time frame. Member of the product configuration management team responsible for documenting new procedures, beta releases, new features, and providing training to support engineers on all new procedures, products, features, and best practices. Provides level 3 software support for all in-house and third-party vendor products. Participates in weekly team meetings, asks questions and provides input on case backlog, technical processes, and new processes within the department. Utilizes previously acquired technical experience as a qa specialist to become actively involved in day-to-day technology team to meet schedules, troubleshoot the problems in an efficient manner, and resolve problems. Conducts complex service training for various product offerings and supportability teams, as needed by the job, writes technical documents related to current products. Serves as a mentor for supportability team employees to improve their individual skill levels. Clearly documents cases with troubleshooting steps, recommendations, and resolutions in the supportability wikis/SharePoint. Manages pivotal ticketing system support queue to support research requests, reports, configuration updates and bau activities. Evaluated potential software products based on new and existing system development and migration. Objective : To work in a challenging atmosphere, which will provide me opportunities for learning and move upward in my career ladder, where knowledge and dedicated hard work will make the meritorious contribution to the growth of the company. Educating clients about the different functions that are available within the spectrum, including their usage through phone and remote training. Providing knowledgeable technical support to ensure that the issues, questions, and needs are properly met in a timely manner. Installed programs and trained customers on grain accounting software. Diagnose and resolve complex technical and product functionality issues related to the command series suite. Knowledge of basic network protocols containing TCP/IP, SMTP, ipv4, HTTP, https etc. Work with all kind of point of sales (Gilbarco, VeriFone, NCR, Wayne, and tender) and troubleshooting barcode scanner issues. Responsible to handle administrative server activities and verifying daily backup of data. Configuration and installation of printers, scanner based web application. Work in a team in a fast-paced environment to provide efficient service to customers. Works with a variety of departments (development, product management, training, and so on) to identify and solve software-related problems. 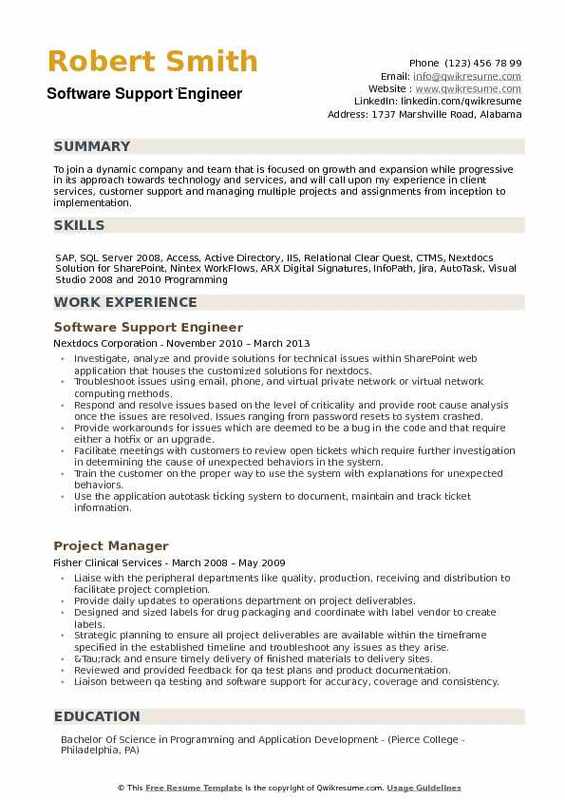 Summary : Software Support Engineer with 12 years in technical and customer support roles. Effectively identifies problems using advanced troubleshooting skills. 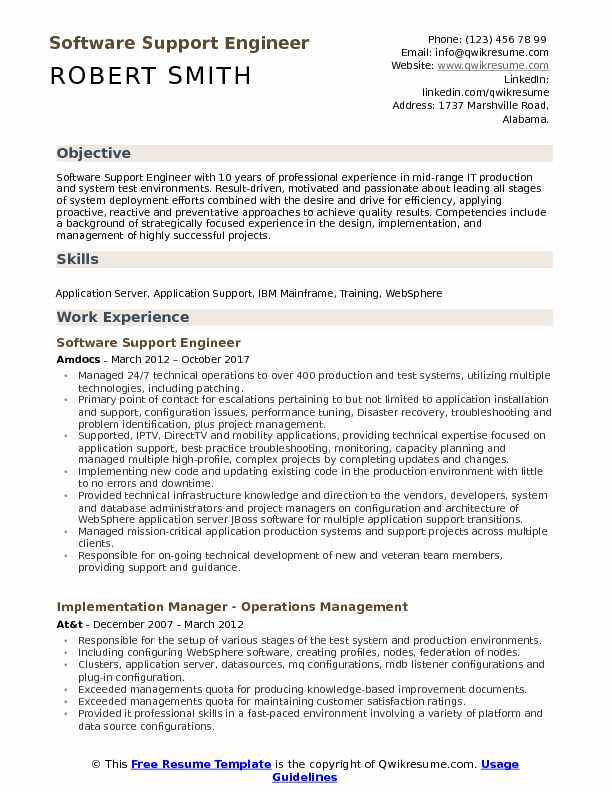 Seeking to benefit an IT Department with complex technical knowledge and strong leadership skills. Communicated effectively with the application developers, engineering architects, professional services engineers, QA analyst, sales and product management teams to reproduce, resolve and document support cases as an advocate for the customer. Installed, maintained and upgraded lab san equipment to enable multiple teams to reproduce and resolve customer issues. Maintained a 100% satisfaction rating from customers supporting both platform and reporting/dashboard applications. Read java based log files to quickly locate and resolve the cause of customer issues. Reviewed and edited development publications submitted by 15 developers. Created training presentations to enable the team to enhance understanding of products and situations. Summary : Overall 8 years of experience in designing, developing and supporting systems by using PowerBuilder, C#.NET, Java, and SharePoint technologies. Business and customer minded professional which offers pragmatic solutions. Experience on customer facing, production support and all phases in software development. Eager to learn new business, technologies, enhance systems and increase customer satisfaction. Gathered requirements, designed, estimated, developed and supported solutions that reduced frauds and increased market competitiveness. Troubleshoot and solved critical production issues and maintained system stability. Achieved the best customer satisfaction in North America by supporting their needs and delivered excellent quality software. Supported and improved over 17 applications in PowerBuilder 12.5, Oracle Tuxedo and Oracle 11g. Developed Oracle pl/sql scripts to fix wrong data, handle migrations and generate reports. Adapted Amdocs methodology for customer needs and reduced bureaucracy of documentation. This led to faster development and deliveries without compromising quality. Organized sessions with coworkers to promote self-learning and knowledge transfer. Acquired knowledge of telecommunications business and billing system using the ensemble. Analyze application logs, thread dumps, and stack traces in relation to core code and all external services. Provide first and third tier software support by email, phone and live chat to 100+ customers. Issues include diagnosing network issues,. 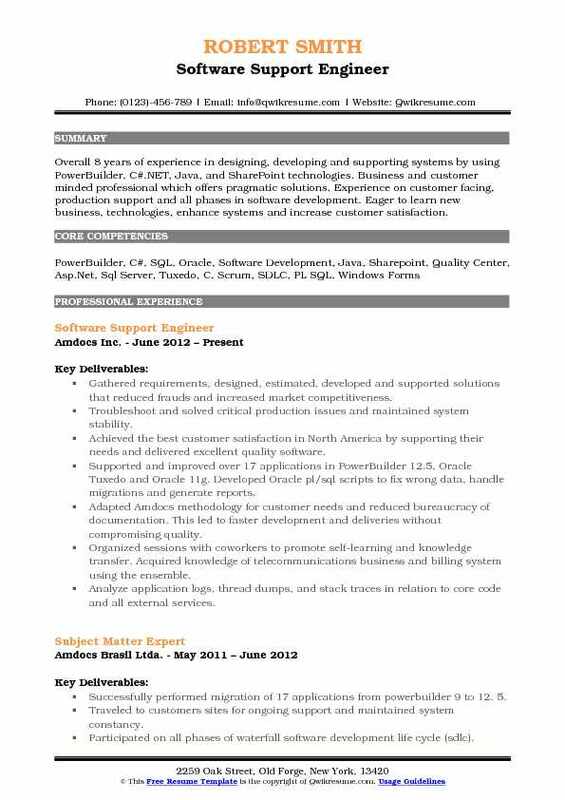 Summary : High-energy/ambitious information technology professional with 15+ years software engineering experience. Seeking challenging opportunity in software support engineer or business analyst fields. Quick learner, natural problem solver, and multi-tasker, with a drive to become better every day. Excellent communicator, with exceptional interpersonal skills. Thrive in high-performance business culture. Provide high-level technical application support for system test and production issues. The focal point for tdms (transfer data management system) file transfer system, which handles 50,000 files per day with 50+ different internal and external interfaces. Routinely resolved issues with transfers before service level agreement timeline potentially saving thousands of dollars each month from contractual violations. Working knowledge of ndm configuration, sftp, ftp, and scp. Resolved many issues with external and internal interfaces without the need for additional support teams. Provided application support for odr (operational data repository) batch processing application. Reviewing logs, manually fixing issues, and resolving batch processing jobs when failed. Regularly wrote and updated maintenance scripts in Linux/Unix, and have used various tools for setting-up monitoring and alerting. Cutting out manual procedures, and saving hundreds of man-hours per year on repeatable processes. Regularly trained others on procedures wrote documentation for the team which reduced mean time to repair and provided a roadmap to follow for recurring issues. Understand SDLC (software development life cycle), and provided support release work. Represented our team on every status call, planning calls, and implementation. 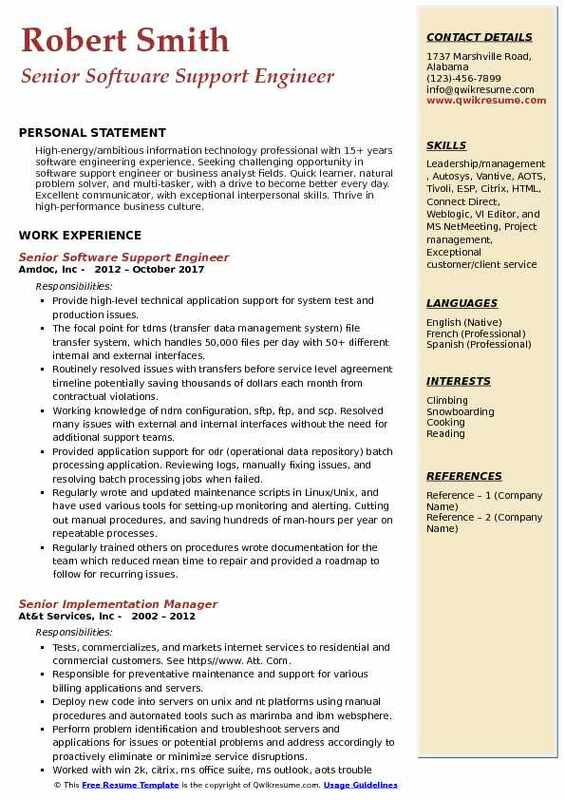 Summary : To join a dynamic company and team that is focused on growth and expansion while progressive in its approach towards technology and services, and will call upon my experience in client services, customer support and managing multiple projects and assignments from inception to implementation. Investigate, analyze and provide solutions for technical issues within SharePoint web application that houses the customized solutions for nextdocs. Troubleshoot issues using email, phone, and virtual private network or virtual network computing methods. Respond and resolve issues based on the level of criticality and provide root cause analysis once the issues are resolved. Issues ranging from password resets to system crashed. Provide workarounds for issues which are deemed to be a bug in the code and that require either a hotfix or an upgrade. Facilitate meetings with customers to review open tickets which require further investigation in determining the cause of unexpected behaviors in the system. Train the customer on the proper way to use the system with explanations for unexpected behaviors. Use the application autotask ticking system to document, maintain and track ticket information. Provide daily updates to customers and management on the status and progress of open issues and paths moving toward final resolutions. Coordinate with third-party vendors assist with root cause analysis and troubleshoot issues involving third-party software that is integrated into the solution.